Changing location is sometimes all you need to spice up your workout. There's nothing like sticking to your tried and true running routes. At home in Annapolis, I often find myself running the same roads again and again. There's something comforting about taking the street that runs parallel to Spa Creek day after day. After a while, you don't need to rely on your watch to tell you how far you've gone. You can listen to your body and base your distance off landmarks. There's something freeing about it! But it can also get pretty stale. I even find that I put additional pressure on myself as I take the same route: "I didn't feel tired when I ran past the Chesapeake Children's Museum yesterday ..." That sort of thing. That's when you know you need a switch-up! Enter the mini road trip to get off the road! I decided to head down to Blacksburg, Virginia, to find some good mountain trails (while taking the opportunity to visit some relatives). Annapolis offers some great water views for runners, but that also means you're running at something close to sea-level. Running in Blacksburg isn't quite as mountainous as running in, say, the Rockies (Thank goodness! Definitely not trying to die this weekend! ), but the mountain views are still stunning, and those hills definitely provided enough resistance to leave me breathless and exhausted. Running off-road and on some popular hiking trails made me wonder: what are the major differences between road running and trail running? I mean, it's different enough to come with a whole new pair of shoes -- shoes I don't have, which also led me to wonder if this was a good excuse to go shopping! 1. You won't be running the whole time. When I'm out on the road I won't be caught dead walking while I'm "out for a run." The shame would be too much! But trail running is totally different. For one, when you have the cover of a thicket of trees and the curve of hills, there are fewer eyes to catch you walking. And really, sometimes it's just necessary to slow to a walk on the trail. There are roots, rocks, ditches, holes, and that seemingly endless incline. Trails aren't going to sidestep the creek that the road has to. 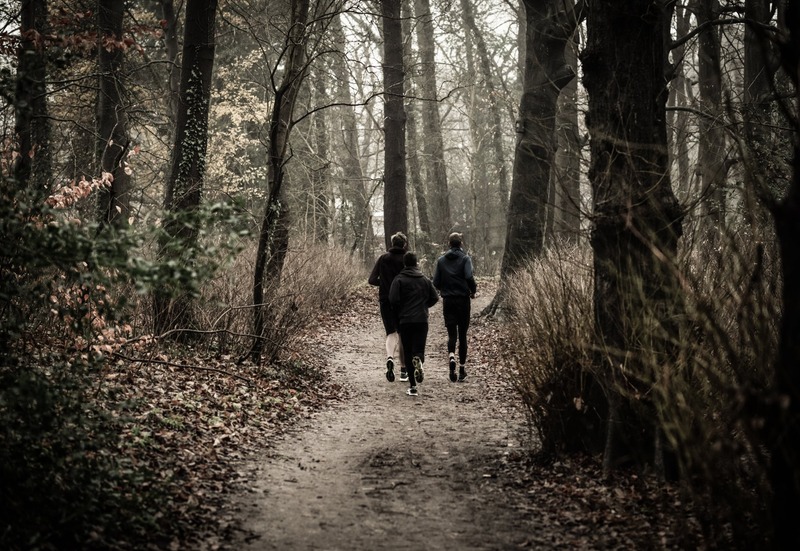 Walking is sometimes safer and smarter when you're trail running. There's never a good reason to risk injury. 2. You should forget about the clock. If your regular training run equates to nine minutes per mile, it's not going to on the trail. Why? Look at #1. You're just going to be slower because of the elements. But your stride is even different on the trails. Your foot plants differently and forces you to use different muscle groups in your legs. Trails are uneven, which can increase your risk of ankle sprains. You'll need to strengthen up your ankles, so click here for a good exercise to add to your daily workout routine. 3. It gives your bones a break. Yup, you read that right. Even with the added obstacles, getting off the road is good for you. A trail is inherently softer than the street or sidewalk. Seems obvious, right? But the difference is actually huge. When I started running competitively in high school, we always trained on pavement. I ran on sidewalks, asphalt bike paths, or on the track every single day. I never had a season where I didn't fracture some major bone in my legs. But when I ran in college, my coach pounded the importance of running off-road into us. We were encouraged to run in the grass beside the sidewalk and avoid hard surfaces as much as possible. My problems with injury were almost completely eradicated by this. This is not to say you should never run on the road. Just make sure you switch it up at least once a week. One of the things I like best about running is that you can do it pretty much anywhere. A gym is essentially a gym no matter where you are -- a pool is a pool, and a sports stadium is a sports stadium. But a running course is never just a running course. It's an experience of exploration and adventure. Travel and get to know your new setting intimately. Once you return home, you'll have a new energy to bring to your familiar haunts. The Run-Around is a weekly feature, focusing on fitness in and around Annapolis, MD. Find more of The Run-Around here.